In the modern world of computers, tablets and smartphones we’re all constantly looking for ways to increase our productivity and to accomplish more in less time. To this end, most of us find that we’re rarely content to do just one thing at once, and will instead at any one time be performing multiple tasks whether that means going shopping while taking on your hands-free kit, or answering e-mails while doing data entry. 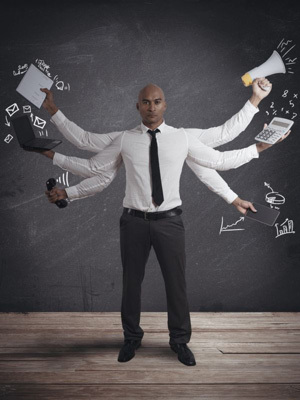 But is multitasking really good for your productivity? Or would you actually achieve more if you were to stick to just one job at a time? Let’s look at the facts. According to studies, the answer to this question is no – multitasking is generally considered not to be good for helping you get more done. The reason for this is that when you multitask, you are by definition dividing your attention between two or more tasks which means you have fewer mental faculties to apply to each. This in turn means that you’ll be likely to do a less good job in each instance, and to work more slowly than you would have done had you done one task followed immediately by the next. Furthermore, each time you interrupt your work on a particular task, it takes a certain amount of time to start working optimally again. In the work place a lot of people talk about ‘flow states’ wherein workers will work with zero distractions and be able to hold their focus much more effectively – and any interruption will disrupt such a state. Studies can tell us something else about what makes for the best productivity by showing which order those tasks should go in. Here, the common belief is that it’s best to do the smallest tasks first to get them out of the way so that you can then focus on the bigger and most important tasks. Research suggests however that you’ll actually perform better if you operate in the reverse manner. In other words – complete your large tasks first such as essay writing, and then do your smaller jobs like answering e-mails later. This way you will be tackling the bigger jobs at the point where you have the most energy and focus, and it will matter less if you’re tired and less productive when you do things like answer e-mails later. However, to say that multitasking is never useful is to oversimplify matters, and obviously some situations do lend themselves well to multitasking. For instance, if you are waiting for something to install, or chatting with a client over Google chat, then there are going to be long pauses where you aren’t doing anything and it wouldn’t make any sense not to try and fill these with something productive. Another exception is using multitasking to help you focus and here if you use some kind of media to create ‘background noise’ (such as music, or perhaps a video with the sound off) it can help you to stay focussed on writing by avoiding boredom from setting in. This way you can distract the ‘creative’ portion of your brain so that you can better use the analytical part without distractions. As a rule then, multitasking is not necessary or even helpful to accomplish maximum productivity, but when used in the right circumstances it can be useful for saving you time, or helping you to avoid boredom.